Go back to bed, baby, please, baby, please. 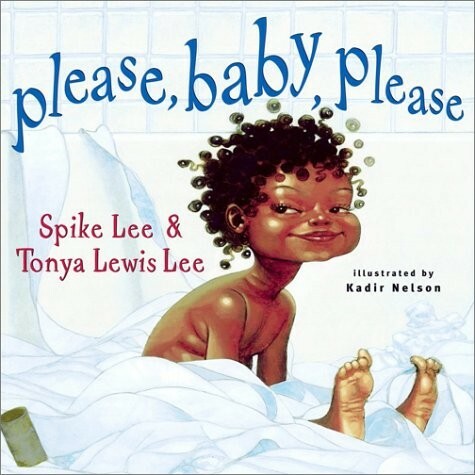 The Lees' diapered dynamo starts early (the VCR reads 3:01 a.m.), with the little girl outlasting her mama sprawled out on the living room floor ("Go back to bed, baby, please, baby, please"). A breakfast of upturned Cheerios follows a few hours later ("Not on your HEAD, baby baby baby, please! "), then play time, a trip to the playground, dinner, and a bath ("Please don't splash, baby baby, please, baby!"). The fun repetition doesn't change up until the book's sweet close, as the curly-haired tyke somehow can't get to sleep ("Kiss me good night? Mama, Mama, Mama, please").